Mombasa, Kenya with Fort Jesus in the background. Being new to this contest, I’d like you to know how much I enjoy reading all the comments that folks include. So much is really helpful to new participants like myself, BUT I really love the wisecracking comments and entries of the frustrated. Thank you!! I’ve never been more frustrated with a VFYWC than this week. Why? Because I’ve found this city before while searching for another week’s window, but I can’t for the life of me remember where it is. I can’t remember which window I was looking for when I found it, my cell browser history doesn’t go back more than a month, and I evidently wasn’t signed into Google Earth when I found it. Arrrrrgggggghhhhhh!!!!!!!!!!! I await the inevitable frustration when you reveal the answer and I immediately remember every detail I’ve been grasping for for the last 72 hours. I hope that’s Dubrovnik! I’ve walked the wall before. We have a densely built group of brick and adobe buildings, mostly with clay tile roofs, overlooking a mountain valley. It is impossible to know for sure, but I think the flag on the parapet in the center of the upper half of the picture is a green-white-red tricolor, either that of Italy or Mexico. Either country works with these buildings and landscape. I’ve managed to stare at the flag long enough to convince myself there is something on the white stripe, so I’m going to say Mexico. There appears to yellow lichen (Xanthoria parietina) on some of the roofs which grows…basically all over the world, but seems to favor coastal areas. So, mountains, valley, near the coast, in Mexico. In other words, just about anywhere in Mexico. The yellow color of a couple of the buildings reminds me of Oaxaca, but I don’t think that is it. The older parts of that city are in a valley, not overlooking it. (The worst part about this challenge for me is that every time I type the name of a Mexican town into Google image search, I get pictures of food. You guys are killing me!) Once again, I am reasonably confident as to region, but I know when I’m beat. Plus I’m thinking it may be Italy after all. Blind guess in (vain) hope of proximity: Taxco, Mexico, because it is on a hillside and the tile roofs seem especially popular there. I dunno, but there’s something about that fortress in the background that reminds me of some of the towns you see near the Bosphorus, somewhere between Istanbul and the Black Sea. Is that specific enough for you? Yeah, thought not. Definitely Mediterranean, but contests have recently featured Spain, southern France, Baleric Islands, Greece. There’s a nice view of water & mountains behind a castle turret. I’m just throwing a dart at the board and guessing Tunis, Tunisia. A village somewhere in Tuscany. I know the turrets one sees is a clue but I’m not sure what the ancient influence is. I’m guessing it’s a village somewhere in Tuscany, Italy. The lichen-stained clay roof tiles, the brick-and-stone architecture, and the gentle hills in the distance (love that deep blue color the mountain has) remind me of the touristy town of Siena, south of Florence. Plus, although the flags, hanging from poles on the two crenellated towers to the left and the center of the photo, are both limp (no wind…grr) I can make out faint red, white, and green stripes, with the red band hanging furthest to the ground—as it should as the red band goes on the right (away from the pole) if you fly it correctly. 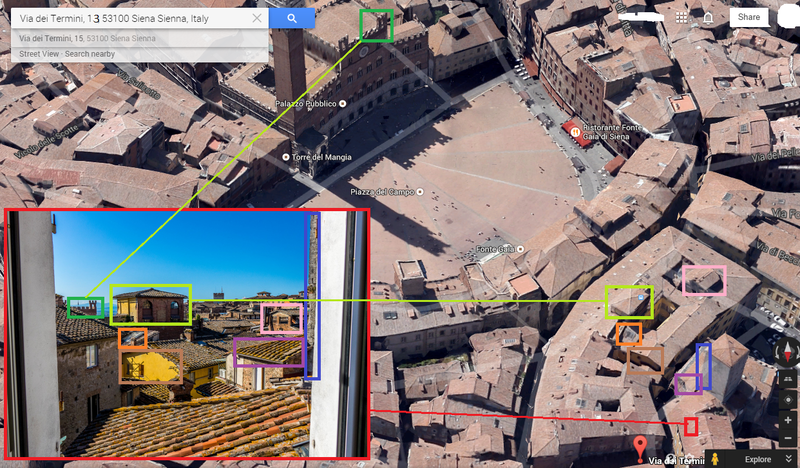 This week, we are in Siena, Italy, just a couple of blocks from the View From Your Window that you ran last summer. Unlike that unmistakable view, the submitter carefully framed the contest picture to avoid including the famous Mangia Tower to the left, leaving only some of the Palazzo Pubblico‘s merlons visible. While the view screams Tuscany, those merlons were the clue I used to find this week’s window. This photo from the hotel’s website and another from a travel website confirmed the location. 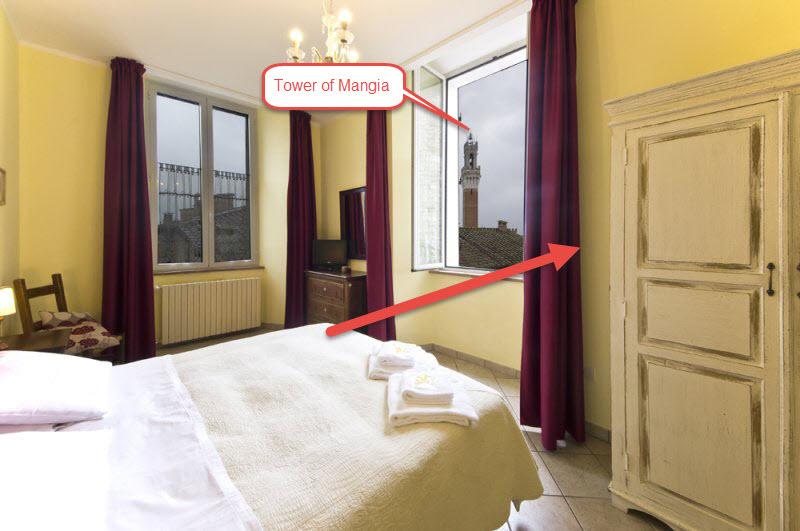 The contest window is in one of the apartment rooms at the I Terizi di Siena at Via dei Termini 13. Although I could not find a room number, it is a south facing room on the fifth floor. The flag of Tuscany and the city flag of Siena. I was using Google Image Search for keywords different keywords like “Italy”, “striped“, “wall”, “armament”, “merlon”, “tower”, “rooftops”, until I finally found the right sillhouette of the Palazzo Pubblico at Piazza del Campo. From there I used Google Earth and panned around until I found the right combination of roofs, chimneys, towers and the glass skylight, that is in the window. Hope my guess is right. First time I am taking part here, found VFYW Contest linked in this Der Spiegel report. This image brings back that magnificent smell of wood-burning fires filling the air. Walking the streets of Montepulciano looked like an ancient city, but smelled like camping. It was the most delightful and unexpected surprise during my trip to Italy. 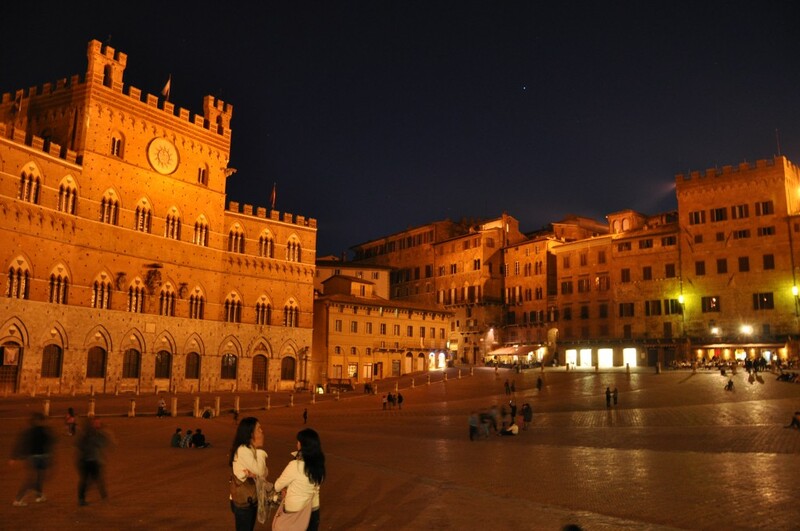 I had one of my most memorable meals ever in Siena, right on the Piazza del Campo at sunset. Cinghiale in umido con polenta, a bottle of Brunello di Montalcino and cantuccini with Vin Santo for dessert. Fu meraviglioso! 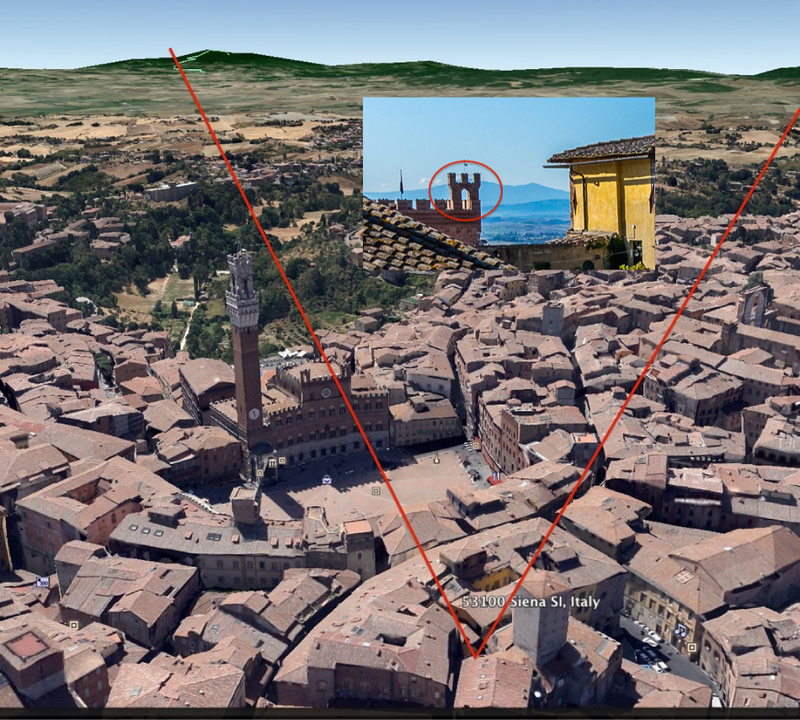 I hope the photographer had a lovely time in Siena and climbed the Torre del Mangia, the tall bell tower at the Palazzo Pubblico. In a neat coincidence, Wikipedia says the bell tower was used as a model for Waterbury Union Station in Waterbury, Connecticut, site of one of last month’s VFYW contests. 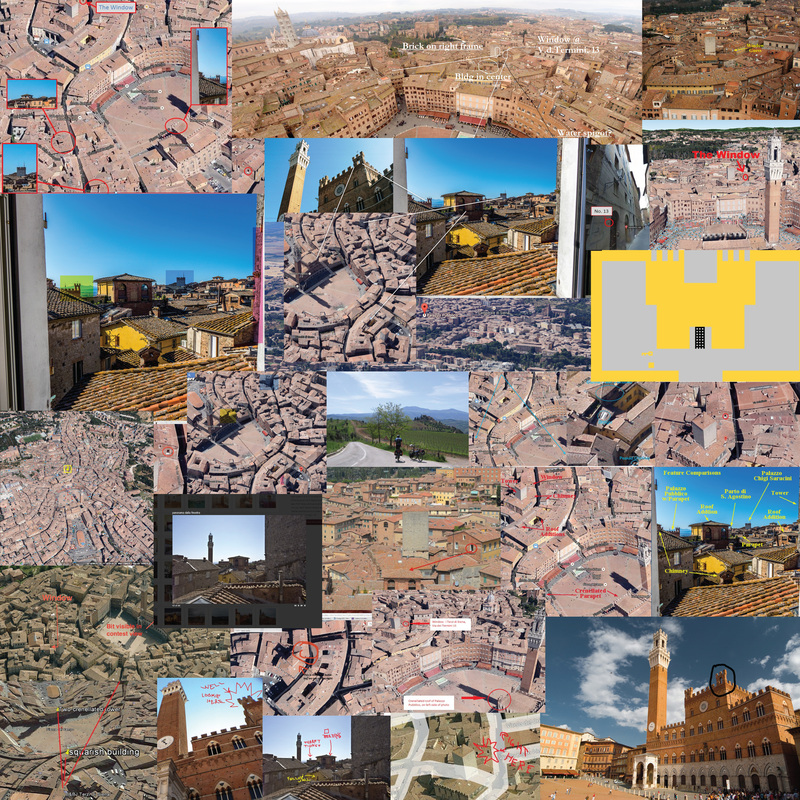 Ah, Siena! Hard to miss, with the famous Torre del Mangia just out of view but the false parapets giving away the Palazzo Pubblico. The Palazzo looks down on the stunning Campo, home of the crazy Palio horse race, last held only 10 days ago (was a VFYW reader in town for the Palio?) Just to right of center, prominent on the horizen is the tower of the Palazzo Chigi-Saracini, now home to the Accademia Musicale Chigiana, an international centre for advanced musical studies. Nice gig if you can get it. Just out of view to the right lies the famous Cathedral of Siena. 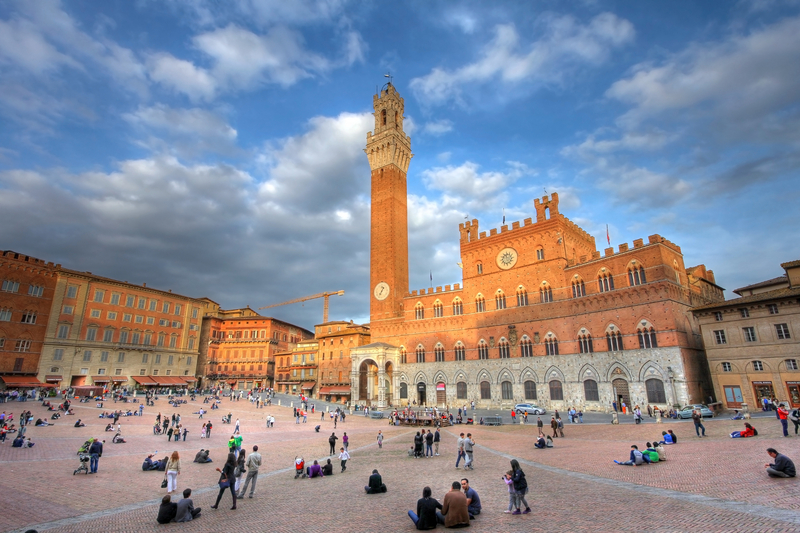 Siena is a great town, incredibly overcrowded during the horse races which are held in the town square. IIRC they are done bare-back so are quite challenging for the jockeys. The bragging rights if your contrada (city section?) wins the race are hard to imagine for an outsider but very real for those involved. In the Spring and Fall when the mobs have left it is a lovely town to tour, amazing old architecture, wonderful restaurants. Thanks again for these wonderful chances to renew old memories (and more often to explore new worlds). 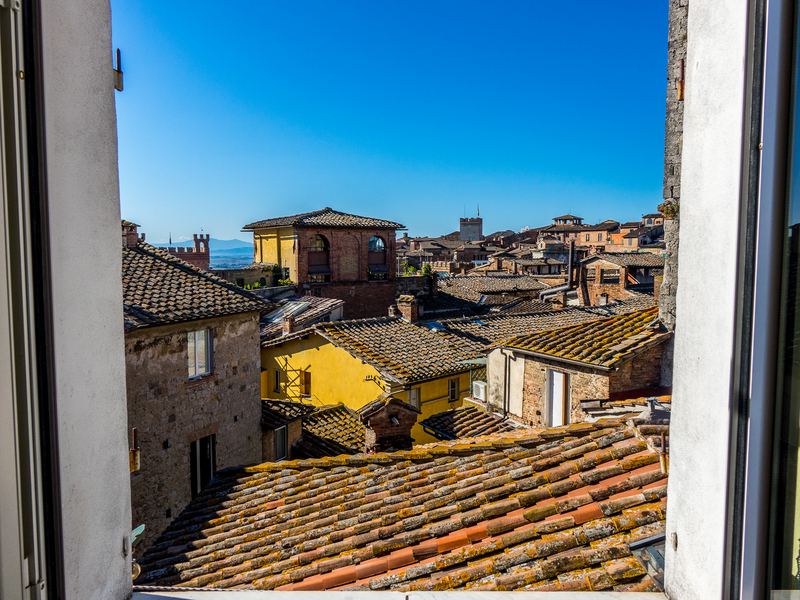 After a failed search of nearby hill towns such as Pienza and Montalcino, I cast my net further to the northwest (the only direction from which Monte Amiata has this profile) and happened upon Siena. 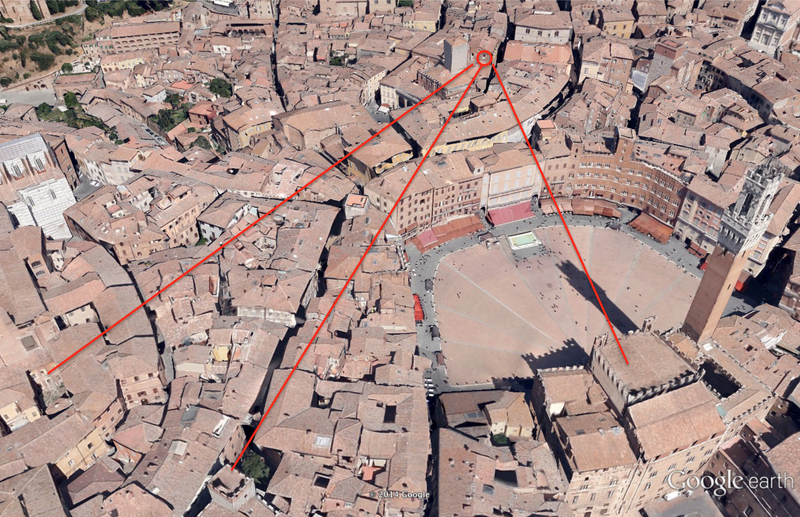 Voila, I instantly saw a match with the corner feature of Siena’s famous Palazzo Pubblico. 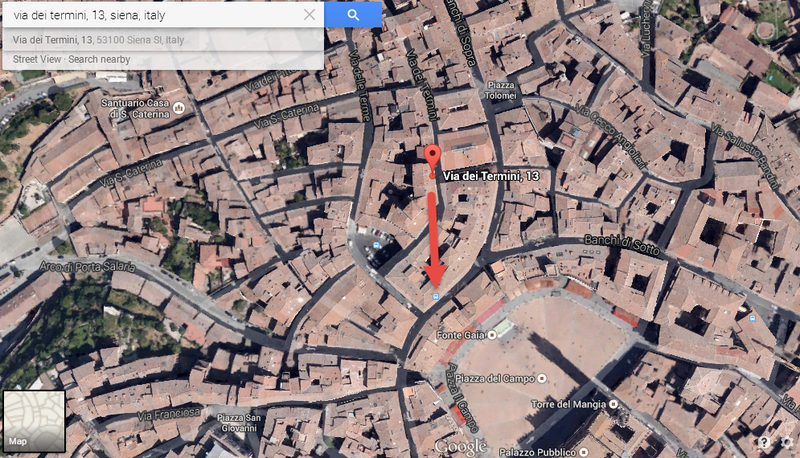 From there, I drew a line from Monte Amiata to the corner of the Palazzo Pubblico and looked for Hotels or B&B’s. Pretty quickly I converged on I Terzi di Siena. 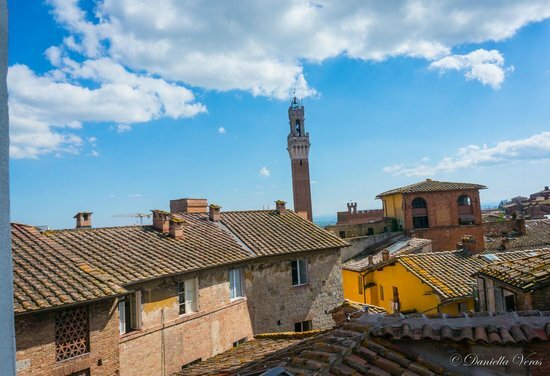 This week’s view comes from Siena, Italy and looks almost due south along a heading of 170.1 degrees. The iconic torre del mangia is just out of frame on the left and the piazza itself is hidden by a steep drop and the buildings in the foreground. The picture was taken from the Camera Romana (Roman room) on the fifth floor of a bed and breakfast called i Terzi di Siena. Tougher this week. Learned a bit about mediterranean roof tiles to get me started and settled on Italy. After browsing photos of old towers in Italy, I came across the Palazzo Pubblico, which had the distinctive crenels in the upper left of the photo. Couldn’t get the view though until I came home from work and fired up Google Earth, which pegged the spot pretty quickly. 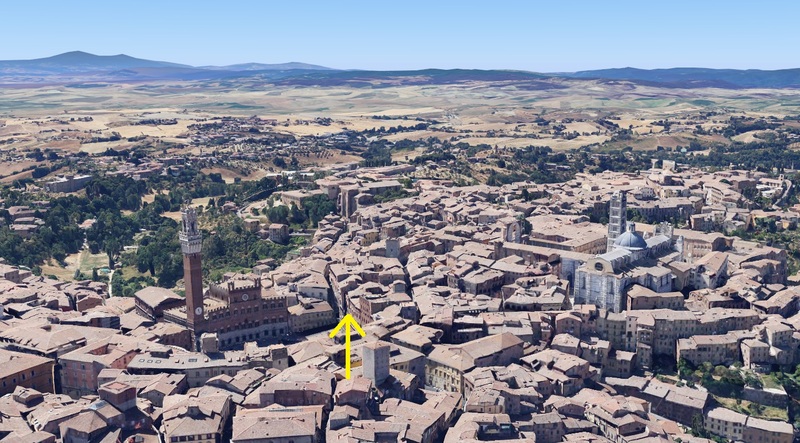 The tower in the center right is the Fondazione Accademia Musicale Chigiana – Onlus, and just out of view is the Siena Cathedral, which otherwise dominates the skyline. The view is looking south from what appears to be Via Dei Termini, 17. See above for the window. 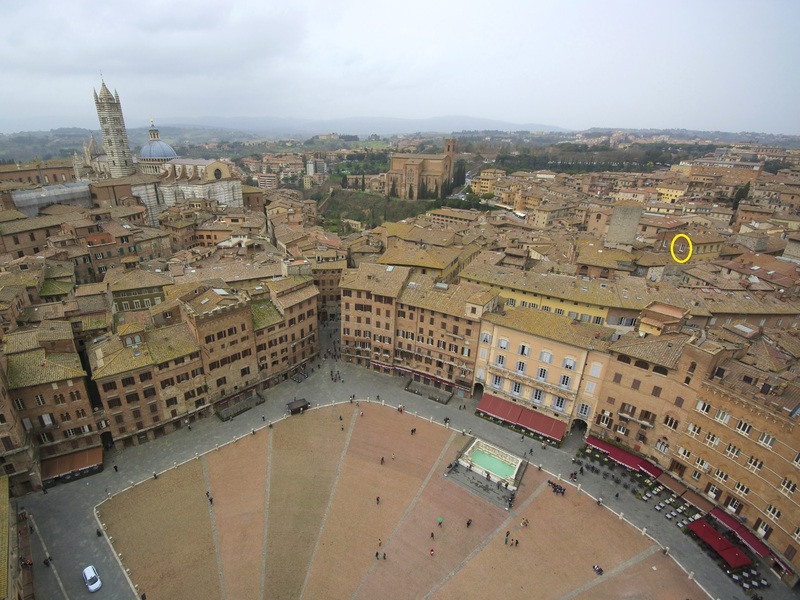 The image was taken in Siena, Italy the day after “Il Palio di Siena,” aka “the most dangerous horse race in the world.” It is a view looking southward from this address: Vie Dei Termini, 13 Siena, Italy. 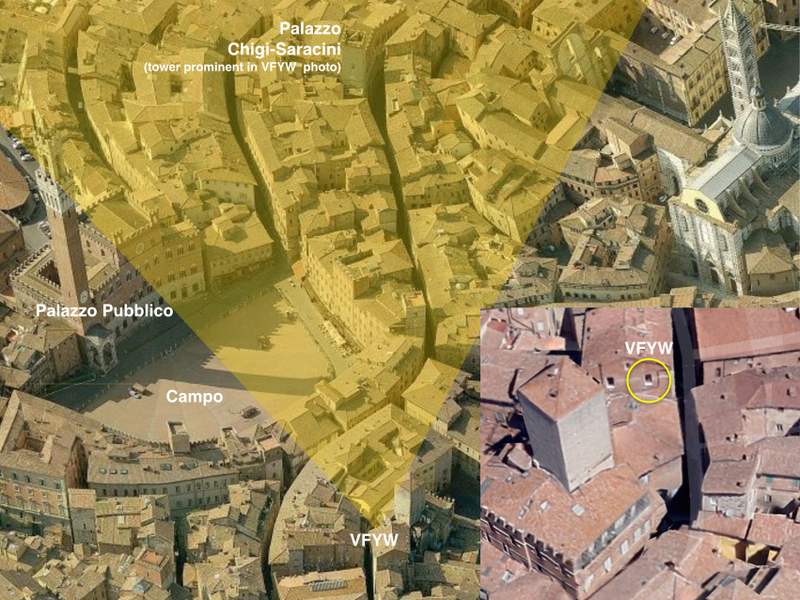 I was staying on the the fifth floor and had a view westward, which had an obstructed view of a busy street, and a view southward (towards Piazza del Campo), which was straight from my bed. I much preferred the southward view! The best giveaway is the flag in the distance to the left. It is hard to see but is white and black, which denotes Siena itself.